Trooper Charles Stanley Hirst, 7914061, 12th Royal Lancers, Royal Armoured Corps. Charles Stanley Hirst was born in Ossett in early 1912, the son of Nelson Hirst and his wife Amy Beatrice Hepworth, who married in the Spring of 1910 in Ossett. Charles was the eldest of five children. Charles Stanley Hirst married Vera Smith, of Ossett in 1938 and there were possibly three children: Pauline, born in 1940 and twins, Barry and Shirley Hirst, born in 1942. The 12th Lancers served as an armoured car regiment equipped with the Morris CS9, during the 1940 campaign in France and Flanders, playing a key part in shielding the retreat to Dunkirk. The Lancers landed in Port Tewfik, Egypt, in November 1941 and were attached to the 1st Armoured Division until July 1942. "Meanwhile, even in their depleted state the Germans and Italians still were advancing and on 26th June they launched another attack on the British rear. On 27th June Mersa Matruh fell. By now the Western Desert was a full of mixed up units all heading east, and with both sides using east others transport it was difficult for both air forces to know who to attack and mistakes were made by both sides. This retreat became known as the 'Gazala Gallop' and during this time the 7th Armoured was frequently in action, though shortly after the fall of Mersa Matruh the 4th Armoured and 7th Motor Brigades came under the command of the 1st Armoured Division, holding the desert flank of the 2nd New Zealand Division." Trooper Charles Stanley Hirst died on the 14th November 1942, as a Prisoner of War in Italian hands, after the S.S. Scillin, carrying 814 British prisoners of war was torpedoed in the Mediterranenan Sea by British submarine HMS "Sahib". In November 1941 in Tripoli in Libya, 814 Allied POWs were embarked in Scillin's hold, which, reportedly, was suitable for only about 300. The result was severe overcrowding and unsanitary conditions. More prisoners would have been embarked, but the British military doctor (Captain Gilbert, RAMC) made vehement and repeated protests. The Italians were not fussy about how they transported prisoners from Libya to Italy. Often tramp steamers, which transported coal, munitions and war materials to Tripoli, were used to take live cargoes on the return trip. On these occasions, little regard was shown for the comfort of or safety of the Prisoners of War, who were treated little better than animals. Some reports state that a further 195 POWs were embarked before Scillin sailed and that there were some 200 Italian troops aboard; others dispute these points saying that the only Italian troops aboard were guards and gun crews and the surplus PoWs were never actually embarked. She sailed on 13 November 1942. On the night of the 14 November 1942, 9 miles north of Kuriat, Tunisia, when on passage from Tripoli for Trapani, S.S. Scillin was ordered to stop with gunfire by the British submarine P212, HMS Sahib. She did not respond, so her Captain decided to torpedo Scillin. At 19.50 hours HMS Sahib fired a torpedo hitting the SS Scillin engine room and the ship sank by the stern in under a minute. Those in the hold had little chance of survival and the ship sank rapidly. Sahib was able to rescue 27 PoWs (26 British and one South African), plus the Scillin's captain and 45 Italian crew members, before the arrival of an Italian warship obliged her to leave. Only when survivors were heard speaking English, did Sahib's captain realize that the Scillin was carrying PoWs. The Ministry of Defence kept this incident a closely guarded secret for fifty-four years, telling relatives that the victimes had died while prisoner-of-war in Italian camps or lost at sea. It was not until 1996, after repeated requests for information from the families of the drowned men that the truth came out. Royal Navy submarine commanders had been ordered not to attack enemy civilian ships that were en route from North Africa to Italy. In an inquiry, Sahib's commander (Lt. John Bromage) was cleared of culpability, since he claimed that Scillin had borne no lights, he had believed that Scillin was carrying Italian troops, had appeared to be en route to Africa and had not responded to the initial shelling (two rounds), intended to halt her. Scillin SS was an Italian Cargo Steamer of 1,591 tons built in 1903 by Russell & Co, Port Glasgow for the Canadian Lake & Ocean Navigation Co. and in 1937 she was acquired by Fratelli Bianchi Soc di Nav, Genoa and renamed Scillin. At the time of his death, Trooper Hirst was aged 29 years, and he is remembered on Column 19 of the Alamein Memorial, Egypt. Alamein is a village, bypassed by the main coast road, approximately 130 kilometres west of Alexandria on the road to Mersa Matruh. The campaign in the Western Desert was fought between the Commonwealth forces (with, later, the addition of two brigades of Free French and one each of Polish and Greek troops) all based in Egypt, and the Axis forces (German and Italian) based in Libya. The battlefield, across which the fighting surged back and forth between 1940 and 1942, was the 1,000 kilometres of desert between Alexandria in Egypt and Benghazi in Libya. It was a campaign of manoeuvre and movement, the objectives being the control of the Mediterranean, the link with the east through the Suez Canal, the Middle East oil supplies and the supply route to Russia through Persia. 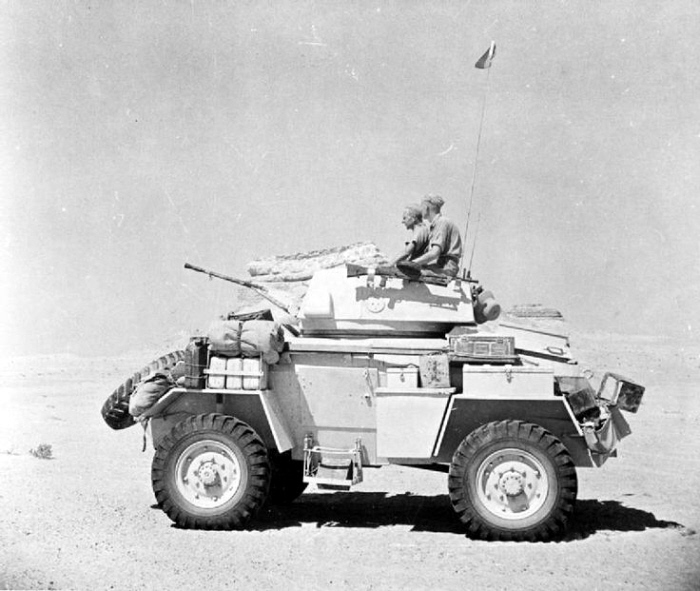 Above: Humber Mk II armoured car of the 12th Royal Lancers on patrol in the Western Desert, 10th August 1942. Thanks also to Andrea Hartley for her help with finding details of the sinking of the S.S. Scillin by the British submarine HMS Sahib.